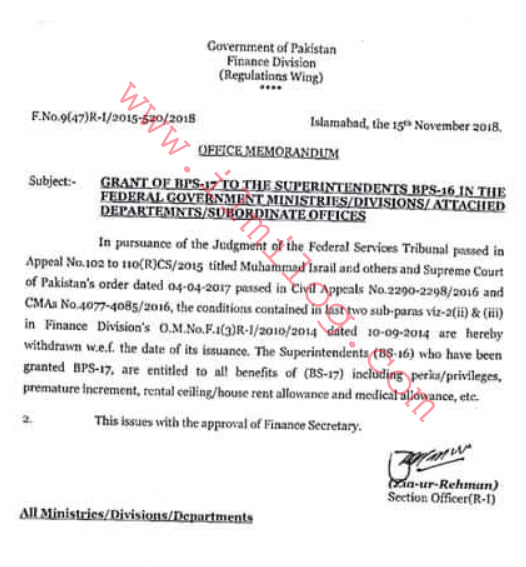 Office Memorandum F.No.9 (47) R-1/2015-520/2018 Islamabad The 15th November 2018 by Government of Pakistan Finance Division (Regulation Wing) has issued regarding Office Memorandum Grant of BPS-17 to the Superintendents BPS-16 Federal Employees. Subject: Grant of BPS-17 to the Superintendents BPS-16 in the federal government Ministries/Divisions and attached departments/ subordinate offices. In pursuance of the Judgment of the Federal Services Tribunal tossed in appeal No 102 to 110 (R)CS/2015 titled Muhammad Israel and others and Supreme Court of Pakistan's order dated 04/04/2017 passed in Coil Appeals No 2290-220/2016 and CSIM No 4077-4085/2016 the conditions contained in last two sub-paras via-2(ii)& (ill) in Finance Division's OM No.F.1(3)R-1/2010/2014 dated 10.044-2014 are hereby withdrawn wef. the date of its issuance. The Superintendents (BS-161 who have been put bps-17. ate entitled to all benefits of (11S-t7) including perks/privileges. Premature Increment rental ceiling/ House rent allowance and medical allowance etc. These Issues pith the approval of Finance Secretary.